The Gay Gamer: Tokyo Jungle's box art will be altered to feature a Rottweiler or Doberman if the game's actually brought to North America, won't it? Tokyo Jungle's box art will be altered to feature a Rottweiler or Doberman if the game's actually brought to North America, won't it? As much as the possibility mentioned in the header above depresses me, I may be able to forgive the graphic designers at SCEA that are sure to be responsible for such a travesty if they alter the title placement on said box art (to the right), too. In case you've never heard of Tokyo Jungle, here's the scoop: It's a "survival action" game set in a deserted, futuristic Japan that's been transformed into a "vicious wildlife wasteland." Also, it was developed by the folks at PlayStation C.A.M.P. and Crispy's (nice name for the development studio, no?) and will be published by Sony Computer Entertainment. Oh, and it will be released--in Japan only, for the time being--both digitally (via PSN) and physically on June 7. 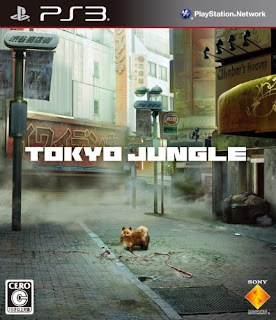 Should Tokyo Jungle (here's a trailer for it, by the way) actually see the light of day in North America, I'll add it to my ever-growing list of awesome games I need to pick up once I finally get around to buying a PS3. I don't suppose this Pomeranian-focused title appeals to any of you fine folks, does it? Oh, you're so, so right, Bryan. I can't see that cover making it over any more than I can see the game itself making to western shores. So many people are bashing it for being a dumb idea and a "waste of resources," but I thought it looked really interesting! Maybe that's because I love animals, or something. Either way, the premise sounds really wacky and would be right up my alley. You don't think the game will make its way to other regions, Anne? I could see it being a PSN-only release myself -- or at least that's what I'm hoping for. I don't get why so many people are bashing the game's premise, to tell you the truth. I think it sounds interesting, if a bit wacky. What's wrong with wacky, though? But yea I reckon it will some "manly" butch dog with horrible fangs growly at you type of look. Don't know if I'd get this game, seems likely not. What the hell did I just watch? I'm assuming you get to be more than just the pomeranian? If so, sign me the hell up! I saw a hippo. I'm in. I *think* you can play as other creatures, Justin. As of now, the Wikipedia page for the game only mentions the pomeranian and a thoroughbred horse. I have to imagine you can play as others, too. Anyway, now it just needs to be released in the US! Amen. I'd sign that petition.